​ Nuestra página de celebraciones. celebrating Special, student-initiated read aloud moment in Mrs. Ben's 1st period Spanish III-Honors Class! Last Wednesday, while we were talking about our childhoods this young man wondered out of his seat. He walked toward my desk where the Spanish Children's books of our PHS World Language Read Aloud Library were, took a book to his desk and began to read. The selection was ¡Jonrón! By Alex Rodríguez. This young man plays baseball, so this book was of particular interest and relevance to him. I offered to read the book aloud to the class and all the students were excited about that. During the reading, one student even read parts of the book with me, so it became a shared read aloud. Also, while we read, students were able to make connections with new vocabulary that was specific to baseball by using their background knowledge and deducing their meaning by context. The reading was a success and all students were actively engaged and reading for meaning! This group is amazing and we have so many teachable moments! On one final note, I would like to thank Mr. Hearn for making the PHS World Language Read Aloud Library possible for our students. Each semester, we add five titles to our read aloud library in each language taught here at PHS. We all have memories of our childhood, memories that we cherish and look back on as we grow. In this post, Mrs. Ben's Spanish Three students reminisce on their childhood and share their memories with you. Enjoy! "All you need is love! All you need is love! All you need is love, love, love is all you need!" Pelion High School Spanish students shared Valentine's Day cards with their favorite teachers to celebrate this day. It was a positive message of love and appreciation that was well-received by all! Enjoy! Phs Spanish students celebrate el día de los muertos. When you take the perspectives and practices of two different cultures and blend them something amazingly beautiful and magical happens -El Día de los Muertos! PHS Spanish students have been experiencing different aspects of this Mexican holiday and have discovered the cultural significance of this celebration. Here are some of the artwork that students created, enjoy! 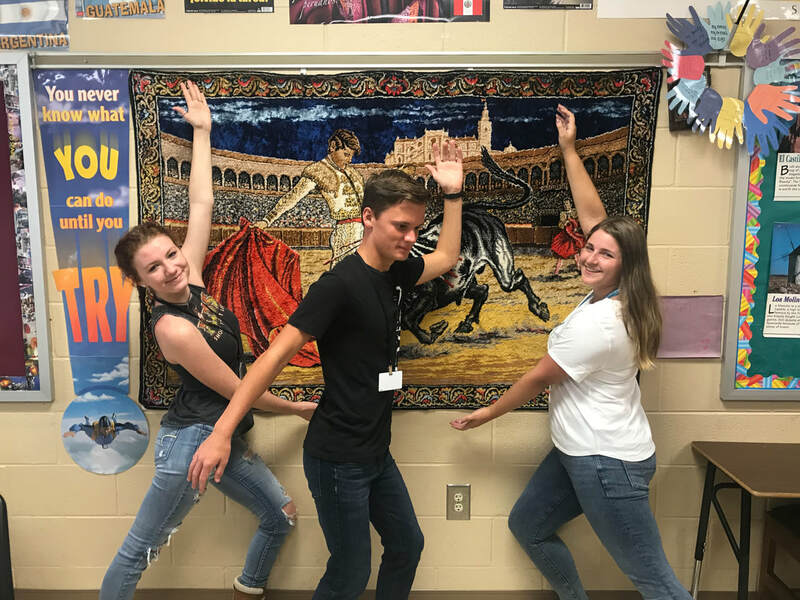 This week's celebration comes from Mrs. Castro's Spanish One students who are using their creativity to make personal connections with Spanish. They are describing themselves and others in Spanish as well as, asking questions and incorporating vocabulary through the verses of a rap song that they have composed. They are having fun, they are engaged, and they are learning Spanish. This is an amazing clip of them in action, enjoy! Mrs. Ben's students Share their childhood memories with you! Our childhood was a special time in which we learned a lot of life-skills and reached many milestones. Mrs. Ben Yahia's Spanish III-Honors students have been learning to talk about their childhood memories in Spanish and have created illustrations of their favorite memories and pastimes. Mrs. Ben Yahia's students share these memories with each other and with you. Enjoy! Celebrating Dual Enrollment Class at PHS! I would like to take a moment to celebrate the Panthers in my Spanish 121 Dual Enrollment Class. These students have worked very hard, helped me overcome a learning curve with the digital aspect of this course, adjusted to the rigors of a college-level class taught at an abbreviated timeline, all while keeping up with their tasks, learning a lot of Spanish, and doing a fantastic job on their first course exam. But that's not all, they have helped each other along the way. They have built their own "little family" and a safe learning environment. This inaugural class of Dual Enrollment will be a tough act to follow! They rock! While this post doesn't showcase student work, it shares a story of triumph over all odds. I am so proud of these Pelion Panthers and look forward to their continued success. They are the true heroes! Un día típico- A typical day! Mrs. Castro's students share their daily routines with us in Spanish through creative and expressive visuals. It is so inspiring to see their work on display in our hall! They are amazing! Enjoy! PHS Spanish students took a field trip to Charleston to see two dance shows today! Flamenco Ballet Company presented the shows "Latin American Rhythms" and "¡Viva España!". Our students experienced Hispanic Culture and Music both as an audience, as well as, participants. Several of our students joined the dancers on stage and learned how to dance Salsa and the Macarena! Students learned the history behind some of the famous hispanic dances and also had an opportunity to learn about the different dances from various Latin American countries. The students had an amazing time and learned a lot! Here are some memories of student experiences that we would like to share with you. Enjoy! ​In observance of Black History Month, students in Mrs. Ben's class read and reflected on the poem "La balada de los dos abuelos" by Nicolás Guillén. This poet was very influential in 20th century Cuba. In this poem, he celebrates his African and European heritages through a metaphor of his two grandfathers. After a close reading of the poem, the students were asked to write individual reflections on what the poem meant to them, what they took away from their reading, and what they wanted to do next with this new knowledge. Quotes were selected from each of the students' reflections, were written on large post-it notes that were folded as to hide what was written, and were hung around the room. Some of the quotes were: "Nicolás Guillén utiliza las figuras de sus abuelos para hablar sobre la raza negra y la raza blanca y dos elementos de su pasado"; "People should stop finding the differences and embrace the similarities of each other"; "Get to know the person before you judge them"; "After they were seen as equal, they sing in harmony"; "No importa el color del humano... hay mucha diversidad"; "Este mensaje es importante para mí, porque creo que deberíamos amar a todos". ​The next day, after rereading the poem, students were asked to stand in front of the post-its, open them, read the quotes and respond to them. Students were given 4 minutes with each note and walked through, responding and reacting to each of the quotes they read. They were also very engaged because they got to share their thoughts and got to see their own thoughts on the wall which gave them ownership of the activity. After this walkthrough was completed, students were asked to collaborate based on what they had indicated that they wished to do with the new knowledge from this poem from their individual reflections. The first team chose to express their message of equality, unity and peace among all in a poster. The second team wanted to learn more about Nicolás Guillén and discovered a link between he and Langston Hughes, they created a poster that elaborates on this discovery and connection with our culture and the target culture. The third team's poster beamed with a message of love and harmony among races. Finally, the fourth team used a verse from the poem to highlight the love and harmony that the grandfathers share. Please join us in remembering and celebrating Black History Month and the contributions that the poets mentioned in this post have made in our cultures. The slide shows depict the walkthrough process and the thoughts shared, as well as, the messages that each team created. Welcome to the Spanish Celebrations of Student Learning brought to you by Mrs. Castro and Mrs. Ben Yahia ("Mrs. Ben")! We are excited to have you in our classes and have the opportunity to celebrate while we learn about the Hispanic culture! Learning a new language and culture is an advantage both for your personal growth, as well as for increasing your earning potential and making you more competitive in the job market. Spanish is fun and all around us, let's learn it together and celebrate!